The job opportunities for Registered Nurses (RNs) are at an all time high, and while this means that you probably won’t be trying to get a job for very long, there would be many candidates for the position you want. Here is a set of 20 sample interview questions for registered nurses and their answers to give you an idea of how questions would be during your interview, and the best answers to them. 1. Why did you choose to become a RN? While honesty is the best policy for answering such questions, avoid answers reeking of materialism, like money or family needs/ pressure. The answer should reflect your passion for caring for others, which ideally should be the case. Sample answer: After some time as a CNA, I felt that I have reached a point where I should be more definitive and more forceful in my contribution to the healthcare sector, which is something I am passionate about. 2. Tell us about a situation where you made a mistake and how you fixed it. We all make mistakes in our job, and especially in a field like nursing, it is very easy to mess things up reasonably while you are just starting out. Sample answer: While jotting down the readings on a patient’s chart in a hurry, I had made a mistake. That would have led to serious complications had not my supervisor discovered the error in the nick of time. Since then, I check my facts at least twice. 3. Where do you see yourself in 5 years from now? While the interviewer wants to check whether you are ambitious and hard-working with questions like this, avoid answers that may not include the institution you are currently interviewing for. Everyone wants a dedicated, goal-driven employee, but only for their improvement. Sample answer: In five years, I would like to be more experienced and more knowledgeable about what I am doing now, and I would be aiming for a doctoral degree which would concretize my efforts. It is important to highlight your strengths not only to impress, but also to align those in charge with what you are good at, so that you can be of the best possible use. Prepare a list of at least your three biggest strengths in your mind and elaborate on them during the interview without appearing to brag. Sample answer: I would say that my biggest strength is my ability to communicate with both my colleagues and my patients, to keep a cool head during emergencies, and to be flexible to requirements in terms of both schedule and service. You should be very honest while stating your weaknesses because not only would that reflect your sincerity, but it would also help your superiors and colleagues to adjust with you while working in teams. While answering such questions, you should ideally stick to character flaws instead of particular mistakes, and it should appear that you are willing to work on your flaws. Sample answer: I would say that my biggest weakness is getting emotionally attached to my charge. The perfectionist that I am, I find it very difficult to create a balance between paying attention to the minutest details of the one I am looking after and remaining unfazed. 6. What would you do if you saw a colleague doing something unethical? This is an extremely tricky question, and you need to carefully consider before answering, as some of the questions like this can be very specific. You are checked for your prioritization as well as your management skills. Sample answer: Before acting, I would try to understand the conditions behind such an action. It could be due to sheer ignorance or inexperience, or due to an emotional state. Depending on the condition, I would try to set the situation correct. Then I would try to make the person understand his/her fault, and maybe make them confess to the authorities if required. If that doesn’t help, I would immediately report to the authorities. 7. How much importance do you attach to interpersonal communication to this profession of a registered nurse? Not everyone is equally proficient in communicating. Yet the profession of nursing often requires fairly good, if not excellent, communication skills on the part of everyone involved in the hospital. So, while you may function best as a lone wolf, it is best to be really aware of this importance, so that it shows in your answer. Sample answer: While I understand that not everyone is equally good at communicating, as far as I am concerned, I think interpersonal communication is really very important, even though I lack medal-winning skills. Yet, I try my best to convey information or strike up conversations with patients and colleagues so that my service is not ineffective, or the patient inconvenienced. 8. What qualities should a registered nurse have, besides professional training? This is a veiled question aimed at discovering the qualities that you value the most in relation to your profession. Sample answer: I feel that since an RN is more experienced than a CNA, he/she should have a better understanding of the intricacies operating both in the sphere of the job at hand, and in interpersonal relationships. Also, he/she should really have a good grasp of technology. I would also expect him/her to be able to form productive relationships with the juniors and be in perfect control. 9. 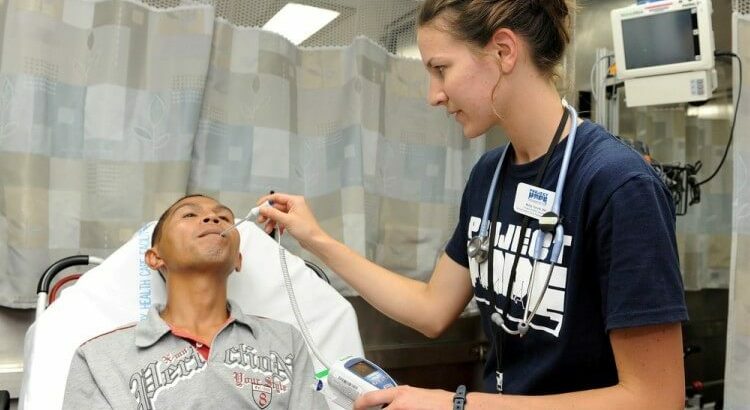 What challenges are you looking for in this registered nurse position? This is a very common question seeking to know what exactly do you expect from your work as a registered nurse, as there must be some obvious reason you worked for this position over that of a CNA. Sample answer: As a registered nurse, I look forward to dealing with more complicated cases with lesser help, all the while coordinating with the CNAs who would be under my supervision. So it would not only mean being more responsible to a patient, but also being responsible for the actions of many working under me. 10. What do you think recommends you for this position? This frequently asked question maybe worded in many ways, but it is your golden chance to prove to your interviewer what makes you better than the 50 other candidates vying for the job. Sample answer: My experience of (insert number of years) years’ experience, my ability to think and act logically during emergencies, my excellent communication skills and my excellent reviews make me ideal for this position. When I get hired for this position, I will be an invaluable part of the institution and will be able to make noteworthy contribution to the healthcare sector. You have to be absolutely specific while answering this question. Remember that while your employer maybe replaceable for you, especially if your motives are chiefly a nice pay package and job security, the company would ensure that they have proper reason to hire you over the rest of the candidates. So, do your research very well before heading for the interview. Sample answer: Thanks to my research and the reputation that your company has, I know that today your company is one of the leading organizations in providing health care services (put in some specific, statistical information). I really believe that I can especially attune myself with the work culture here. Because of this, I want to be a part of your workforce so that I can benefit while fulfilling my objective of providing quality care. It depends a lot on the type of institution where you are seeking employment – a hospital, a company, a medical facility, a nursing home, etc. The best answer would reveal an awareness of the company’s work culture. Your answer need not be a lie, as you can easily opt out of the interview in the first place if you anticipate a clash of values. Sample answer: The policy for women workers in your institution is really famous and it has impressed me a lot. Considering how difficult it is for women to seek remedial for the various problems arising in the workplace, or to find a schedule that would enable them to put their best in caring for patients without compromising on their essential needs, I want to experience such an environment firsthand. 13. How much salary do you expect? While it is expected that you had applied for a particular job knowing approximately how much you would be paid, it is best not to fix on a sum from your end when asked this question. A big quotation may turn off your employer and suggest that you are more interested in the money than the work, while a small one may make you come across as desperate. Sample answer: I would expect a salary that would be appropriate for my position and would take into consideration my dedication, my qualification and my work experience. 14. How would you deal with a rude doctor? This is a strategic question meant to test not only your ability to handle your seniors in the workplace during charged situations, but also to understand how aware you are of protocol. Keep in mind that this is a very possible and common situation, so you need to appear convincing and logical. Sample answer: If the doctor is being rude during an emergency, I may overlook it if within reasonable limits. Else, I may have a talk with the doctor alone, in case he/she is having a bad day or if he/she finds something problematic on my part. If I see that the reason for this rudeness is simply beyond reason, I would get in touch with the appropriate superior(s). 15. Why are you leaving your current job? Take care NOT to criticize your previous workplace. Also, it is important to avoid your mistakes, unless they are on the record, as much as possible. Instead, make your working experience appear as a beneficial relationship as much as possible. Sample answer: While I learnt a lot in the job that I am leaving, and believe to have contributed a lot to it, I feel that I have reached a point where there isn’t any space for me to grow anymore, both as a person and as a professional. 16. Do you have experience in preparing facilities and handling advance equipment? Again, an RN has usually the maximum workload in a hospital’s nursing team. As an RN, you are expected to look into stocks and inventories, be constantly on the alert regarding rooms and advanced equipments, and prepare instruments with the utmost care prior to an operation or a check-up. And while all this is an integral part of your training, without practical experience you won’t be able to make much sense of the intricacies. Sample answer: Yes, I do have experience in preparing facilities and handling advanced equipment as after completion of my training, I have taken part in simulation workshops, closely observed my seniors, and have presided over situations at times. 17. How would you deal with a fussy patient? Again, this is a question directed at checking your response to very real problems that may arise. Fussy patients can often be the biggest challenges because there is a risk of your primary purpose, namely caring for patients, getting affected. Think before you answer. Sample answer: I understand that some patients may find it difficult to communicate with the nurse because of trust issues or due to emotional states arising out of biological conditions. In that case, I would proceed very slowly and carefully following all the instructions, trying my level best to get to be trusted with the everyday needs and communication. In case those don’t work, I would be consulting the supervisor. 18. Describe your former supervisor. Again, it is best not to criticize your ex-boss in negative terms. Not only do you not want to appear fussy to those looking to hire you, you also don’t want to create the impression that you would be compromising the integrity of your workplace by badmouthing your colleagues in other potential scenarios. Sample answer: (Insert name) was a competent supervisor who knew how to go about her job without compromising on quality of service. I learnt a lot while working under her. 19. What measures have you taken to upgrade your knowledge? Through this question, the interviewer would want to understand your level of dedication to know what you have done to become an RN, and what do you do to stay up to date in your field. Sample answer: I got myself enrolled in an advanced course for improving my skills. I also regularly take part in seminars and have subscriptions for a number of journals to keep myself updated. It is best to think of some questions that express your genuine interest over some aspect of the company you are not very clear about before heading out for the interview. This way, not only do you appear keen and inquisitive, but you also get answers to your doubts. Sample answer: What facilities are available in your company for registered nurses who want to advance their skill and knowledge? Take note of the fact that honesty is always the best policy when answering questions regarding vocations as demanding as nursing, because then the conviction is very evident. So while it is okay to browse through sample interview tips and answers to get an idea, most of them are amenable to change and would be designed to test your thinking skills and your investment in the job.